Helen Lyle is a graduate student conducting research for her thesis on urban legends. While interviewing freshmen about their superstitions, she hears about a local legend known as Candyman. The legend contains many thematic elements similar to the most well known urban legends, including endangered babysitters, spirits who appear in mirrors when fatally summoned, and maniac killers with unnatural deformities. The legend states that while Candyman was the son of a slave, he nevertheless became a well known artist. Yet, after falling in love with a white woman who becomes pregnant, Candyman is chased through the plantation and when caught, has his drawing hand cut off and replaced with a hook. He is then smeared with honey (prompting the locals to chant ‘Candyman’ a total of 5 times- hence the ‘say his name 5 times into the mirror’), stolen from a nearby apiary, and the bees sting him to death. 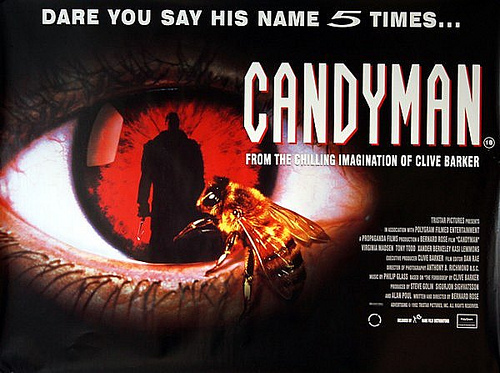 The legend also claims that Candyman is summoned by anyone who looks into a mirror and chants his name five times (similar to the Bloody Mary folkloric tale). Summoning him often costs the individual their own life. Later that evening, Helen and her friend Bernadette jokingly call Candyman’s name into the mirror in Helen’s bathroom but nothing happens. While conducting her research, Helen enters the notorious gang-ridden Cabrini–Green housing project, the site of a recent unsolved murder. There she meets Anne-Marie McCoy, one of the residents, as well as a young boy named Jake, who tells her a disturbing story of a child who was horribly mutilated in a public restroom near the projects, supposedly by Candyman. While exploring the run-down restroom, Helen is attacked by a gang member carrying a hook who has taken the Candyman moniker as his own to enhance his own street credibility by associating himself with the legend. Helen survives the assault and is able to later identify her attacker to the police. Helen later returns to school but hears a voice calling her name as she walks through a parking garage. Another man she encounters states he is the Candyman of the urban legend and because of Helen’s disbelief in him, he must now prove to her that he is real. Helen blacks out and wakes up in Anne-Marie’s apartment, covered in blood. Anne-Marie, whose Rottweiler has been decapitated and whose baby is also missing, attacks Helen and she is forced to defend herself from Anne-Marie using a meat cleaver. The police then enter the apartment and arrest Helen. Is Helen going crazy or will Candyman come for her next? Three words adequately describe “Candyman”: Scary. As. Hell. I was twelve years old when I saw the movie for the first time and it hasn’t left my mind since. From the haunting Phillip Glass score to the uncompromising promises by both Tony Todd as Candyman and Virginia Madsen (who has never looked better) as Helen, everything about this movie is sensationally scary. Madsen, in particular, seems to relish playing against time and causes the audience to be sympathetic with her character when a lesser actress would have just come across as annoying. A cheap “Carrie” rip-off of an editing is the only false beat in this superb thriller from one of the masters of the horror genre, Clive Barker.